Pillow Case Pineapple Sofa Car Waist Cushion Cover Pink Home Decorative 18"x18"
VIOLA 1000 CUSHION COVER. Cushion cover NO FILLING, 100% cotton. Especially used as a bed decor cushion cover. 100% COTTON. MISSONI HOME CUSHION COVER MASTER MODERNO COLLECTION OMAR 160 16x16" 12x 24"
NADD 481 24x24". Peciiar weaving because il as tactility as seen in the detailed picturesl100% POLYPROPYLENE. BAS RELIEF. Weight of each pillow cover 510 grams 1.10 lbs. Cushion cover no filling 60x60 cm - 24"x 24" Abt. Cushion cover NO FILLING 40x40 cm 16" x 16" 100% cotton dyed on yarn. It is similar to poplin but heavier in cotton. MISSONI HOME PILLOW COVER BOUQUET COLLECTION YARRAMAN T70 Sz 16"x16" & 20"x20"
KNITTED 3D CHEVRON EFFECT Cushion cover NO FILLING 40x40cm 16"x16" Abt, 100% velour cotton, jacquard woven. NATHAN 170 PILLOW COVER. 3D CHEVRONS EFFECT 16x16". MISSONI HOME PILLOW COVER MASTERMODERNO COLLECTION HOMER T59 16x16" 12x24"
LANCILLOTTO 156 TRICOT. 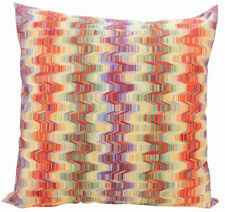 Cushion pillow cover NO FILLING 80% finest cotton - 20% wool, knitted, with the famous MISSONI chevrons. UNMISTAKABLE MISSONI STYLE. CUSHION COVER WOOL COTTON. Double face, each picture shows one side of the cover. MISSONI HOME PILLOW COVER COTTON REPPS GREY OR BLUE STRIPED EMY 16x16"
UPHOLSTERY JACQUARD. Jacquard woven, not printed. Upholstery fabric cushion cover 50x50 cm 20" x 20" abt. NEW JERSEY T34R. MISSONI HOME CUSHION COVER NEW JERSEY T34 COTTON JACQUARD 50x50cm 20X20"
NEW JERSEY T34 16x16". Pillow cover NO FILLING 100% COTTON. (50x50 cm). UPHOLSTERY JACQUARD. It is similar to poplin but heavier in cotton. MACBETH T34. Glazed to give a glossy look jacquard woven, not printed. GLAZED CUSHION COVER. Weight of each pillow cover 210 grams 7.5 Oz. 31% cotton, 31% POLYESTER, 30% RAYON VISCOSE, 8% ACRILIC. Cushion cover NO FILLING 60x60 cm - 24"x 24" Abt. MISSONI HOME PILLOW COVER MASTER MODERNO COLLECTION HOMER 159 16x16" 12 x 24"
JANSHUI 59. They are stain-proof and never get rotten. A special water and oil repellent finishing, promotes the elimination of stains and does not allow the formation of mould. Acrylic fibre 100% mass-dyed resists discolouration due to sun, water and all weather conditions in general. LIPKI 150 16x16". Cushion cover NO FILLING 40x40 cm 16" x 16" 100% cotton dyed on yarn. It is similar to poplin but heavier in cotton. BOUQUET COLLECTION. Robert Kaufman, Decorative, Anti-Stain Pillow Cover, 16"x16". Handcrafted, decorative throw pillow. Robert Kaufman's fabric. Size: 16"x16". Dry cleanor hand wash with cold water and mild detergent (Woolite). 100% cotton. Ikea SLOJGRAN Pillow Cushion Cover (1 pc). Care instructions:Machine wash warm, normal cycle. Communication is very important, and I always try to respond ASAP. Color: Beige & Gray. Material: 100 % cotton. PILLOW COVER 16x16". Cotton sateen characteristics: Cotton fabric woven like satin with a glossy surface. Lustrous and smooth with the sheen in a filling direction. Combed yarns are used. Cushion cover 40x40cm 16" x 16", 100% glossy cotton sateen, NO FILLING. Combine this cotton and polyester pillow with other solid or striped cushions and pillows to create a cozy spot for yourself in your favorite room. Ashland Summer Coastal Village Pink Striped Knit Pillow New 15 x 15. Aqua Bronze Gold Striped. Feather Filled. Large Dense Throw Pillow. Very Nice-Quality Throw Pillow. Has zipper for easy pillow removal. Striped Design. NWT ASHLAND Decor "Coastal Village" Collection ,Striped Pink Pillow 16" X16"
NWT ASHLAND Decor "Coastal Village" Collection ,Nubby Woven Pillow 16" X16" Cotton . 16" Square ,overstuffed nubby textured throw pillow. 100% polyester fiberfill stuffing. LIPKI 1500 16x16". Cushion cover NO FILLING 40x40 cm 16" x 16" 100% cotton dyed on yarn. It is similar to poplin but heavier in cotton.